Whether your skin has several white bumps, red pimples, or your nose is dotted with blackheads, you want to get rid of them—fast! But, to win the battle against acne, you must know what type of breakout you have. Only then can you start using the best acne products to improve your skin—and there are research-proven options that deliver impressive results when used consistently. A blackhead is also known as an open comedone. Technically, it’s not acne, but rather a type of clogged pore that can occur on its own or along with acne. Blackheads form when dead skin cells mix with excess oil and debris in the pore lining. Once the oil mix reaches the opening of the pore (at skin’s surface), it oxidizes, turning black. Despite their appearance, blackheads aren’t due to the skin being dirty. We discuss how to get rid of blackheads in this article, but the most important product for controlling them is a leave-on BHA exfoliant. Tiny white bumps on skin are another type of clogged pore. They’re sometimes referred to as closed comedones because, unlike blackheads, the head of the white bump is covered by a thin layer of skin, so the contents aren’t exposed to the air so don’t oxidize and turn black. These white bumps can show up anywhere on the face, but occur most often on the forehead, cheeks, and undereye area. We share must-know info about how to get rid of white bumps in this article. Papules are the most common type of pimples, and what most people tend to think of as acne or describe as “zits.” These small to medium-size pimples look pink to slightly red, have a soft surface, and are filled with fluid and excess oil. They can feel a bit sore when touched. Papules are the easiest type of acne to manage. A combination of a gentle cleanser, an over-the-counter product with benzoyl peroxide, and a leave-on salicylic acid (BHA) exfoliant usually does the trick, and the exfoliant works wonders for clogged pores. Pustules are what occur when papules—the mild type of acne—worsen. The initial pimple becomes larger, engorged with more oil and fluid as the skin attempts to deal with the problem on its own. Most teens with acne have a mix of papules and pustules. Although pustular acne can respond well to over-the-counter acne products, this type of acne might also need help from prescription products a dermatologist can provide. Examples of prescription products that might help include several retinoids . If your dermatologist prescribes a retinoid, keep in mind you might need to experiment with a few before finding the one that works best. This is severe acne, and the most difficult type to manage. Rather than being small and red, these pimples tend to feel like large, hardened lumps. 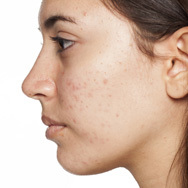 With this type of acne, you often feel it before you see it—and it doesn’t feel good! Left untreated, this type of bad acne can cause permanent damage to skin. Given that fact and the likelihood of minimal results from anti-acne skincare alone, nodular acne requires the care of a dermatologist—so don’t hesitate to contact one if this describes your acne. All of the above types of breakouts can also be part of back acne, sometimes referred to as “bacne”, and they can also show up on the chest.